I replaced the thermal fuse in my Kenmore electric dryer last week (went bad). It burned out again yesterday so I threw a new one in today. Just noticed that as soon as I plug in the dryer, the heating element starts up without the dryer being started. The thermal fuse must be a symptom and not the problem. What would cause the heater to start without the dryer being turned on? Clothes are now searing hot. Not a problem with the vent. Obviously it's unplugged right now. Heating element shorted to ground, thats what overheated causing thermal fuse to go. Do you have a model number? Looks like model 110 62812100 according to the tag. Do you think if the heating element went bad it would start heating as soon as I plug it in? Sounds like its shorted to heater casing, yes replace it. The heating element was so hot it cracked the alum mounting plate, but it still has continuity. Obviously it needs replaced. Could the thermostat have caused this? 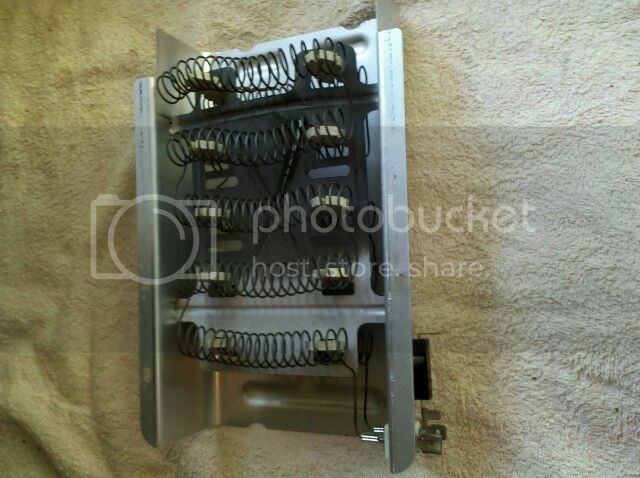 Check continuity between either terminals and the heater CASING. Let us know. Replace it, or you will be buying a lot of thermal fuses. From the looks of that element, I'd say you also have restricted venting. Make sure the dryer is not pushed against the wall and crushing the vent. If you have a long vent run, brush it out. The Linteater, RLE202, works great for this. NEVER hurts to check the vent, but I believe that sagging is going to be caused by the heater being energized when not actually running.... No air flow. The heating element is working like it should believe it or not. No continuity between the case and ANY of the terminals. Complete continuity between all the terminals at room temperature. No broken wire and wire is not touching the case. Is the heating element supposed to have power going to it when the dryer is off but plugged in? I haven't probed it yet but that's my guess as to what's happening. Check this first attachment down loaded and check vent and good idea to replace thermostat on heater too .Than attach vent to dryer and i use a test light on the cycling thermostat to make sure its cycling on the right thermostat.Of croase you leave back panel off for this test.Also can use a voltmeter. There is a switch on the motor that closes once the motor is running. Once the switch is closed it lets voltage go to the heating element. When the motor stops running the switch should open and kill the power to the heating element. This motor switch could be bad if you have voltage to the heating element when the dryer motor is not running. You can not replace just the switch as the switch only come with a new motor. The switch could be stuck if it has heavy lint build up. It could also be stuck if the contacts are pitted. Some people can clean the switches/contact to make them work again, but I find this is often a temporary fix and sooner or later the motor needs to be replaced. Here is a video you may find helpful too. Let us know what you find or if you have any other questions. All these answers are right and all of them are in are brains when we are diagnosing this problem. Lets us no what happens. Your centrifugal switch on the motor is most likely stuck in the closed position. AJ, thanks for the video link and thanks everyone for your help! I'll tear into it today (after the Daytona 500 of course), I'll post what I find. Sounds like I'll be weighing the merits of fixing a 13 yr old dryer or buying a new one (wife wants new one). You have the best dryer made. If you do buy new one stay with lint filter on top and no touch tone pads.Best dryer on market.